It is an MRI examination of the shoulder joint using a contrast material injected into the joint. A small need is introduced into the capsule surrrounding the shoulder joint. This process is done with the help of a “video” X-Ray procedure called fluoroscopy. 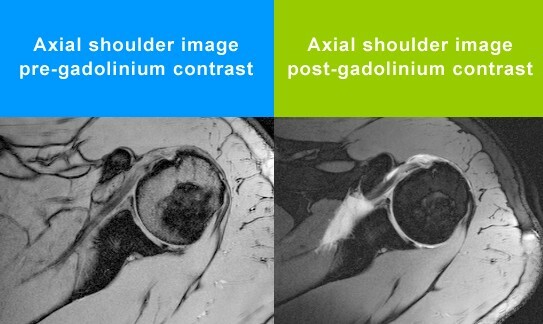 Once in the joint, a small amount of MRI contrast material, called Gadolinium, is injected along with some saline. This helps delineate healthy tissue from diseased tissue. For example, a torn labrum may not displace without joint distension by the contrast material. Once the contrast is in the joint, the patient proceeds to the MRI suite for the rest of the exam. The study is most often done to rule out or assess a SLAP lesion in the shoulder. SLAP means, Superior Labral Antero Posterior. It is a tear in the labrum (lip), which is a fibrous ring around the rim of the shoulder socket (glenoid cavity). The ring stabilizes the head of the upper arm (humerus). A disruption of the labrum is associated with pain and destabilization of the shoulder joint.